Usually, when I sit down to write a story, I have a pretty good idea of who my characters are. I know their names, I know their personalities, I know what their general roles are in the story. But they don't become REAL to me until I figure out what it is that makes them different from every other character in every other book. Take a stereotype. 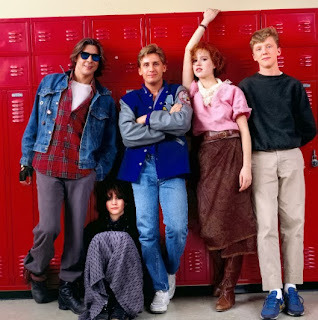 I like to start with The Breakfast Club in my head. A jock, a princess, a loner, a brain, and a troublemaker. (There's a million more. The drama queen. The artist. The painfully shy kid. The bully.) Very, very broad categories. I know we're supposed to avoid stereotypes, and I agree, but here's the thing--stereotypes exist for a reason. They're everywhere, and they're relatable. You say that your character is a gorgeous quarterback, and most of your readers immediately have an idea in their heads about what kind of person he is. And that's where you use the stereotype to your advantage--make your character more interesting by going against the expected traits. Maybe your quarterback is a girl. Or gay. Or secretly hates football. Maybe he's actually not all that popular because his parents are control freaks who won't let him do anything (they're obsessed with making sure he's goes to college on a full ride thanks to football, so he's not allowed to hang out on the weekends, but he meets a girl and....yeah, okay I want to write about this poor sweet guy with no social life who's supposed to be the king of the school). My point is- give your characters a quirk. There's always a great thread of character quirks in the Nanowrimomessage boards every year. I love to read through it. I've seen everything from "speaks only in song lyrics" to "paralyzed by conflict" to "constantly plays freeze tag." Some of them wouldn't be practical for an entire novel, but they give me fun ideas for scenes or inspire other more suitable quirks. In BETWEEN, my main character Charlie (Oh p.s. for those of you who know my book- Harper is no longer Harper. SURPRISE!) doesn't swear. She makes up her own swear words. So she says things like, "Holy sheet!" and "unduckingbelievable" and "glammit." There's also a pixie who's obsessed with country music. And a hot boy who's an annoying goody two-shoes. The quirks can serve various purposes--they might provide comic relief, they can be plot device, they can cause conflict--but whatever quirk a character has, it must be consistent. Don't just set up the quirk in the beginning and then forget it throughout the rest of the book. Make sure that the quirk isn't there ONLY to make a character memorable. Make it mean something. Use it to delve deeper into your character's thoughts and personality. (i.e., Why doesn't Charlie swear? Why is Seth such a rule-follower? Why does Lulu love Patsy Cline?) You know how posers are quirky just to be quirky? Don't do that to your characters. What about you? Do you have any particular tips or tricks you use when creating characters?